This track will take you from the Zig Zag Railways Clarance Station to Lithgow the long way. Ok, yes you could just take the Bells line of road, but what fun would there be in that? 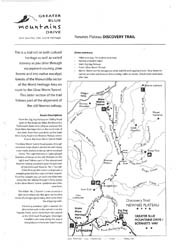 This route takes lots of tracks and trails and will take you approx 180 KM to do it. &nbsp;Now a little warning here. The weather can change very quickly here and you should pack plenty of warm clothing with you. The track takes you to many places including the Zig Zag Railway, the Glow Worm Tunnel, Lost City, Sunny Side Ridge, Black Fellows Hands, Baal Bone Gap and Long Swamp before hitting the black top to end back in Lithgow near McDonalds. This would make a nice overnight trip. There are many worth while side trips off these main tracks shown but this would and most likely would increase the difficulty significantly so be warned.